Last year I probably had pasta three or four times a week, whereas so far this year I have had none. It has been nearly two months without the Italian shape-shifter, meaning I have missed out on around 28 pasta dishes and counting. I was heading to my parents for the weekend, and knowing they had made pasta before and had a kitchen big enough to facilitate this sort of activity I decided this would be the weekend of pasta. As I’m a planner as soon as I knew I was making pasta I had to sit and think about which delicious dish I was going to create for my first taste of pasta From Scratch. With pasta dishes there are endless options of goodness from a basic garlic oil and chilli, to Bolognaise, Carbonara, and Arrabbiata. In the end I opted for a tomato based sauce, although I will definitely be trying a basic garlic sauce when I next get my rolling pin out – which will hopefully be soon as writing about it makes it quite an appealing prospect! One day I will get ambitious and organised enough to try something like pasta mid week, but for now weekend cooking allows me to spend 4 or 5 hours trying something new without eating a whole pile of fruit, loaf of bread or collapsing from starvation. So I embarked on my journey into the gluttenous gluttony of pasta. For some reason, and I don’t know why (maybe it’s the good luck I have had with everything else? ), I thought pasta would work perfectly. I presumed it would go really well and be pretty simple. I don’t want to mislead you, it is actually pretty simple but for some reason the food gods weren’t smiling quite so brightly on me this weekend and the pasta was a bit of a challenge. The weekend started off brilliantly, with a Saturday morning trip to get the ingredients. Being out in the countryside I was lucky enough to have an inspiring stroll around Stroud farmers market. Looking at great quality fresh ingredients got me really excited. Not only did I manage to get the Tipo 00 flour, fresh eggs and lovely garlic (which I was assured was French- not Chinese like the supermarkets) but also fresh yeast and some beautiful Rhubarb! My original project had no aspirations to be anything other than From Scratch. But since starting it I have realised it’s all about great food and great tastes and as a result I’m going to try and eat as seasonally and as locally produced as possible. Because I think as much as making your own food does lead to delicious dishes, when it’s been dug up fairly recently and is currently at its best it’s like collecting enough gold tokens in the Crystal Dome and scooping the grand prize rather than just ending up with the ‘well done’ crystal. So those are the sorts of ingredients I should be trying to source. And despite living in London it’s not really that difficult, but perhaps more on that another time as I think we are all hungry for pasta. So after the obligatory trip to the supermarket to get the remainder of items I headed back with parents in tow – who will now be referred to as Sue (not because that’s her name, but because she acted as a superb Sous Chef) and my dad The Food Connoisseur. I’m going to start with the pasta because quite frankly everything else is just a side order of goodness. 1. Place the flour in a bowl (you need quite a big bowl for this) – alternatively you can use a board (the traditional way). Make a well in the center of the flour and crack the eggs into it. Beat the eggs with a fork until smooth. Using the tips of your fingers, mix the eggs with the flour, incorporating a little at a time, until everything is combined. 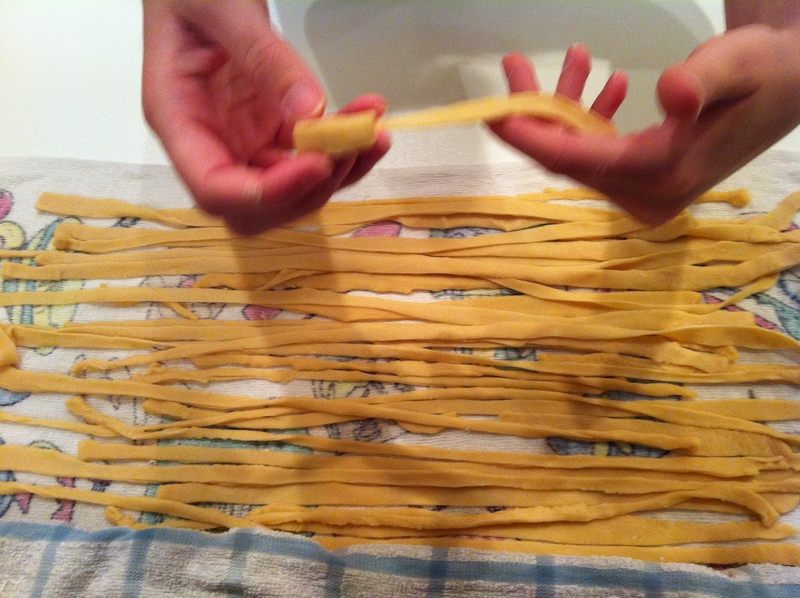 The next stage is where it gets a bit more complex, the rolling of the pasta. 3. Start by taking a portion of dough about the size of an orange and flattening it on your board. I rolled out by hand ( I think it’s much easier and will look a lot closer to pasta if you can use a pasta machine, but as I rolled by hand I will give instructions for this). So with your flattened dough start a sequence of rolling and turning the dough and then folding in half. Keep to the following pattern of roll, turn, roll, fold, roll, turn, roll, fold. 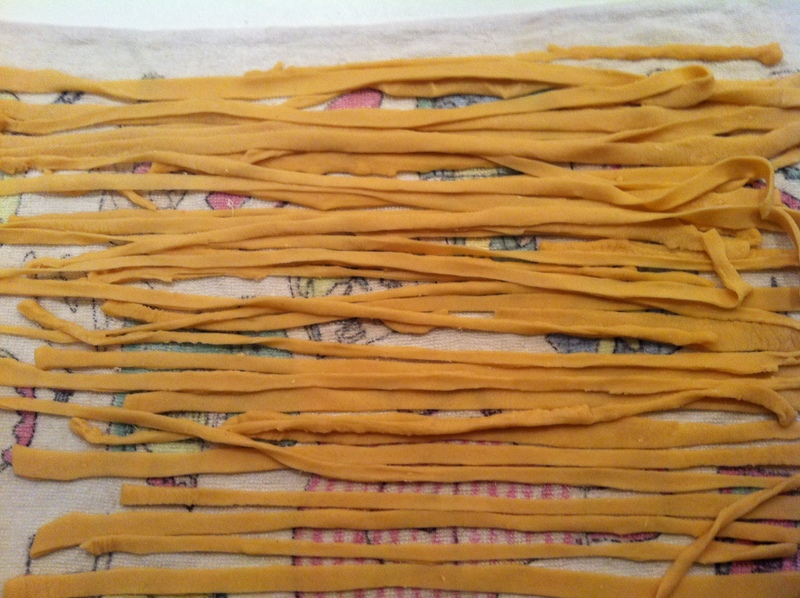 Do this about 5 or 6 times and you will feel the quality of the pasta change as it will get even smoother. 4. To roll out into your final pasta keep rolling and turning until you have a good shaped rectangle, then roll this down until it’s just thinner than a beer mat. To turn this into long strips loosely roll the dough up like a Swiss roll and then slice down. 5. Unravel these quickly as they get stuck together if you take to long and that’s just a pain to roll them again. So that’s the pasta – aside from the fact it was slightly too thick at the ends and took about 10 mins longer to cook than expected, I think it turned out pretty well. 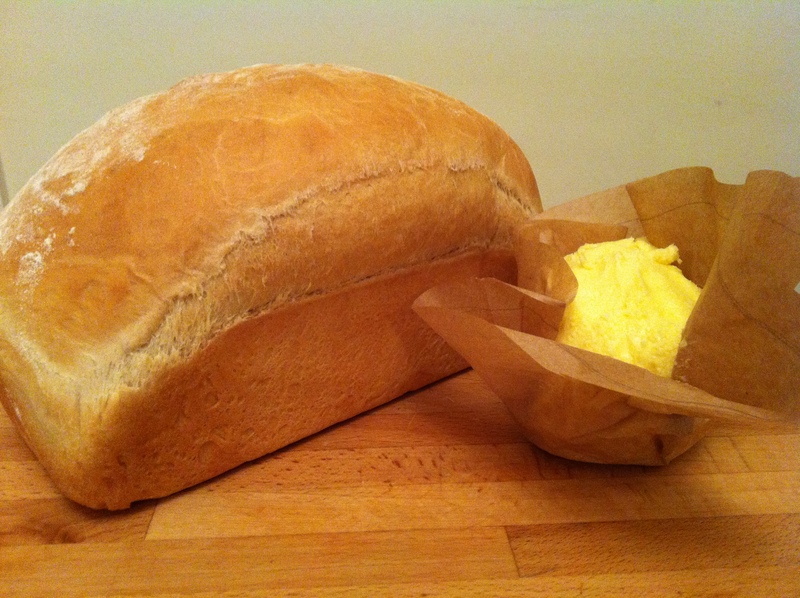 Just as an aside I had some dough left over and used it again later this week and rolled it much thinner – it cooked in about 5 mins and was delicious so I think it just needed to be that little bit thinner. I felt happy with the pasta under my belt but to make the perfect pasta dish I had been craving I needed an exquisite sauce. So I made tomato with bacon on Saturday and classic bolognaise on Thursday. Add chopped garlic, small chunks of apple, salt and pepper and celery chunks – let this simmer until everything has softened and mushed together. That’s a great tomato base which at this point can be customised to whatever you wish. 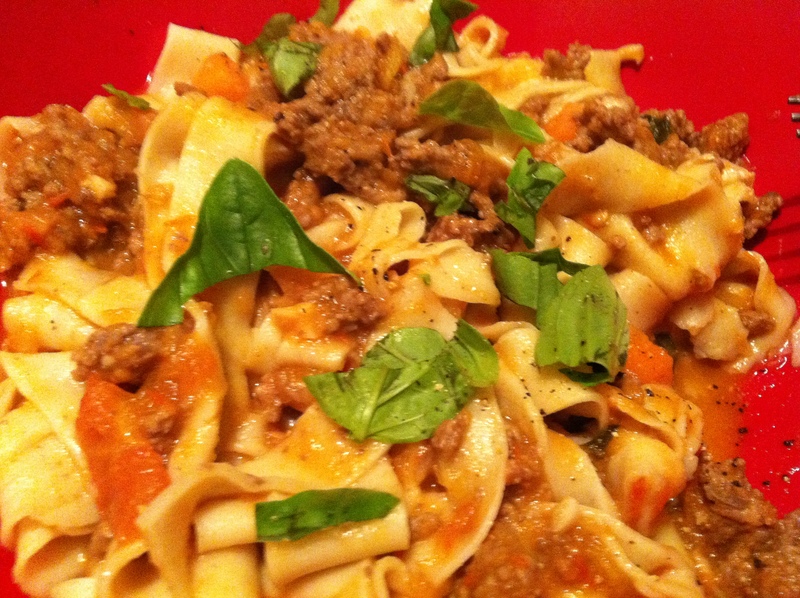 As I said I did a great bolognaise – by making this sauce, frying off mince in a separate pan then adding it with some carrot and basil to the sauce- once you have cooked your pasta add a bit of pasta water to loosen the sauce. 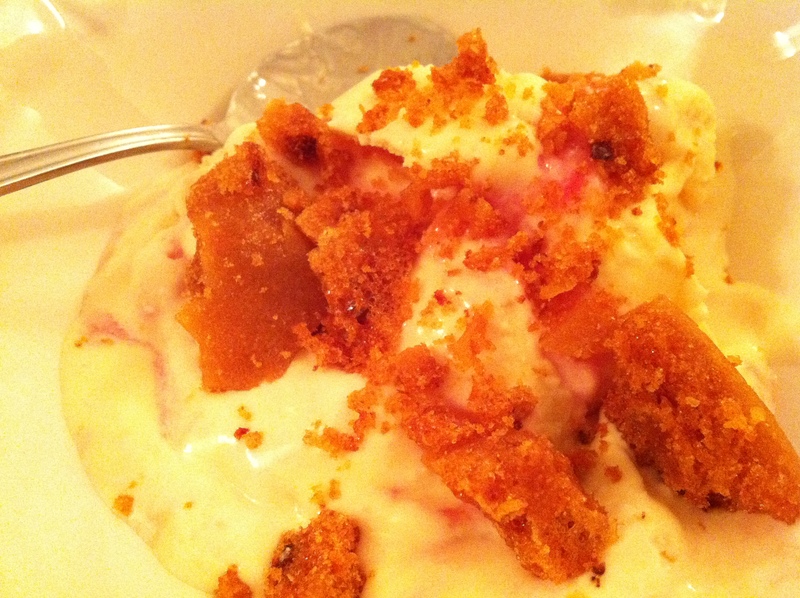 So on to the sweet after taste of success- vanilla and rhubarb ripple ice cream with honeycomb topping. This ended up being a brilliant dessert. Halve the vanilla pods lengthways and scrape out the seeds. Add the pods to the cream and bring to the boil, then add the sugar and stir until the sugar has dissolved. Meanwhile, whisk the egg yolks in a large bowl then slowly whisk in the hot cream mixture. Pour the mixture through a fine sieve into another bowl and whisk in the vanilla seeds. Then strain the liquid through a sieve into a pan (pressing down to get all of the juice), simmer until the juice has a syrup texture and leave to cool. Pour the ice cream mixture into a freezer-proof container, then ripple through the rhubarb syrup and freeze for 4-5 hours, or until set. I then made some honeycomb to crackle on top. Grease a 20cm/8in square baking tin with vegetable oil. Gently heat the butter, sugar and golden syrup in a medium-heavy based pan until the sugar has dissolved. Turn up the heat and boil rapidly, without stirring. If the mixture goes darker at one side of the mix, then gently swirl the pan to mix it all together. Keep boiling until the mixture goes a golden-brown colour – this will take about 5 minutes. ( I didn’t have a heavy based pan – so mine got slightly burnt on the bottom- if you don’t have one just swirl more regularly to stop the pan catching). 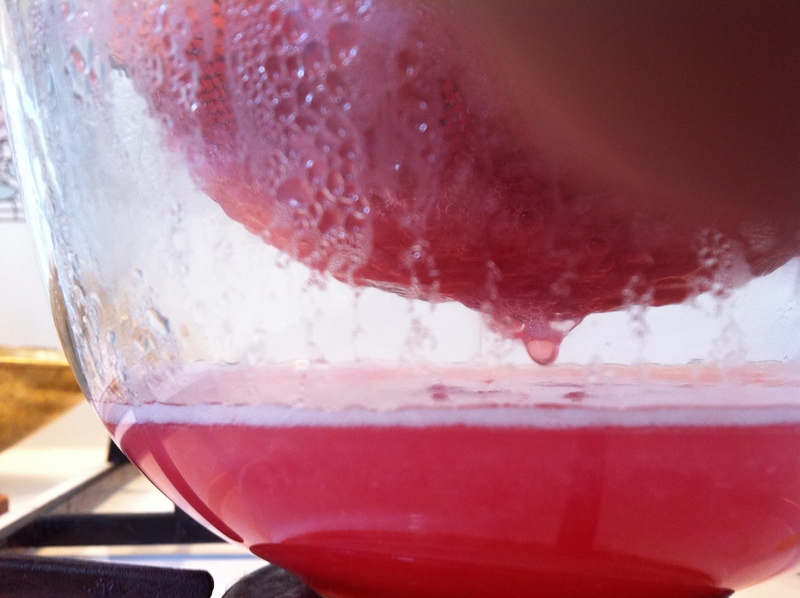 Add the bicarbonate of soda and stir it for a few seconds, which will make the mixture expand and fizz. Tip the honeycomb into the oiled baking tin and leave until cold and set. Once this set I bashed it into pieces and sprinkled over the finished ice cream. Anyway I found it very exciting and definitely added it to my list of current favorite dishes. All in all it was a great weekend of food, even if the pasta deities weren’t quite as welcoming as the bread overlord! However attempt number two definitely hit the mark, which suggests that as with all things practice makes perfect. This entry was posted in Basics, Recipes and tagged Dessert, Supper by lucy. Bookmark the permalink. love it lucy – my fave blog ever! please make me some tasty food sometime soon – it all sounds amazing! Thanks Laura. Glad you enjoyed it.